Overcoming Fear – Let's do exploits together! Of course not! We cannot live in a bubble-wrapped world and even God, the Almighty Father, never promised that Christians will have it easy or comfortable. Some humans, and I mean me, are comfortable with the safe and nice because it offers us security. In this secure environment we are in control and nothing will take us by surprise. But you know what? Helen Keller said that “security is mostly a superstition. It does not exist in nature, nor do the children of men as a whole experience it. Avoiding danger is no safer in the long run than outright exposure. Life is either a daring adventure or nothing.” And if there is anyone there who can talk about feeling lost and unsafe and unsteady it will be Hellen Keller. For those who do not know her, she was born blind and deaf. Although that did not stop her from becoming an author, a humanitarian and lecturer. Ultimately, it is man’s pride that causes this fear and it is probably born out of something from your childhood or past experiences. Either way, we must overcome such egotism and realise that everything starts from something and everyone will start from nothing. Let us be courageous and comfortable enough to make mistakes. Also, I’d like to think mistakes are steps in a ladder we call success. In order for us to ascend to the top we must take it pace by pace, one footstep at a time. This year let us live our life to the fullest. Let us be patient, for every good thing takes time and patience. As I always tell my friends, those things you worked hard for and those things you waited for are the more exceptional and extraordinary once you have achieved them and grasped them within your hands. 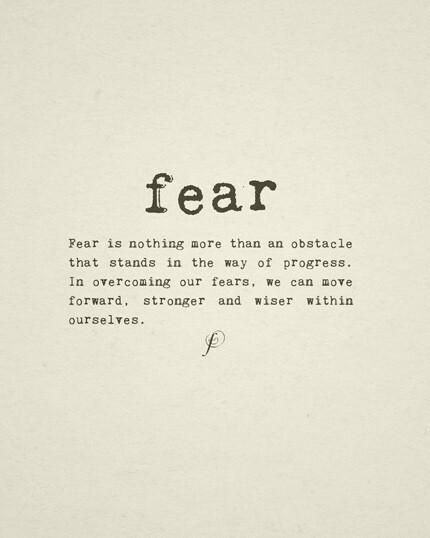 Here’s to a year of facing our fears head on and not backing down! We need to realise that it is a conscious effort to not let this fear overtake our lives. You will never feel the ‘right’ time when fear is upon you. The solution is to start doing what you fear doing and starting it now.